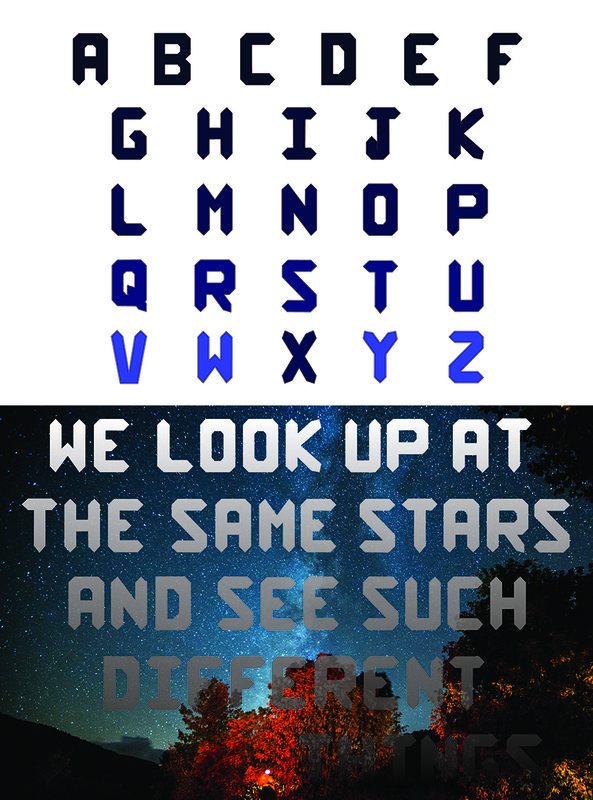 Custom alphabet design inspired by the aesthetics of outer space and galaxies. This work was completed for DTC independent study in spring 2017. Using a text excerpt of your choosing for inspiration, custom design an alphabet that embodies the spirit of your text. Depending on your text, choose either a modular design method or a design method based on a physical material or environment. Once you have designed the full alphabet—using Illustrator, Photoshop, or a combination of the two*—design a large format poster that showcases all the letters of your alphabet in alphabetical order, as well as in a relevant sentence, phrase, or paragraph from or related to your source of inspiration. Your large format poster will either be printed in our computer lab or through large format printing at BCU. * You should consult with your instructor immediately if you feel you need specific technical instruction in either Photoshop or Illustrator for the completion of this project. Choose a text excerpt that you’d like to use to inspire both your custom typeface design and your poster. It may be poetry, fiction, nonfiction, or an alternative type of text, such as a list, as long as you think it will compel you to make interesting visual choices, and as long as it is of decent length (several paragraphs or equivalent is ideal). You will post your proposal for your alphabet design on the class blog. Develop your alphabet-building rules according to either a modular method or a materials-based method. Choose carefully, considering how your method will affect the appearance of your typeface. Regardless of which method you choose and what your unique rules say, you will strive to create an alphabet with common characteristics such as weight, proportion, and density, as described in your Letter reading from “Thinking with Type.” How will your method affect the intrinsic proportions and visual impression of your alphabet? And will this visual impression be appropriate for the spirit of the text you have chosen? You will design all 26 letters of the alphabet. Your final presentation on your large format poster will include a full alphabet, A to Z, as well as a relevant sentence, phrase, or paragraph from or related to your source of inspiration. (You might wish to use a pangram, a sentence that uses all letters of the alphabet, such as “The quick brown fox jumps over the lazy dog.”) You may choose to design uppercase or lowercase letters, or both if you are feeling ambitious. If you choose a modular method: you will define a fixed element to be used within a larger system or structure, such as a grid. Choose what your fixed element(s) is/are and how they may fit together to build the 26 letters of your alphabet. Make sure you can articulate the rules you follow in writing, as you will hand them in with your final poster. “Modular Lettering” with strong figure/ground relationship from Lupton’s gdbasics website. If you choose a materials-based method: Use a physical material or environment to build the 26 letters of your alphabet. Allow the limitations and opportunities offered by the physical nature of the material/environment to help you define alphabet-building rules. Make sure you can articulate the rules you follow in writing, as you will hand them in with your final poster. “Ready-Made Alphabets” from Lupton’s gdbasics website. How do the letters sit on the baseline? Set width: Condensed, compressed, normal, wide, extended? How do the curved parts of the letters relate to the straight parts? Regardless of which method you choose to create your alphabet, you will need to bring your letters into the digital realm, even if they are based on physical materials. If you choose a materials-based method, make sure you can work with scans or photos at a high resolution. You may use Illustrator and/or Photoshop as you develop your alphabet and as you layout your poster design. Make sure you are prepared to print at a high resolution regardless of which program your are using (make sure raster effects are set to high in Illustrator). Your poster design should be large format, 18 x 24-inches, oriented horizontally or vertically. You may need to pay for large format printing through BCU printing services on campus. This will be $15-$25. Your instructor will notify you as soon as possible if we cannot print the posters in our computer lab. NOTE: As far as we know, we will be able to print in our computer lab on the large format printer, but we will delay actual printing until your instructor is able to see you final design files. Printing will take place sometime in November. You will turn in your final design file(s) that show 1) the layout of your poster and 2) the work you did to design your alphabet. Make sure your file(s) is/are well-organized so they are easy for your instructor to navigate. Files should be saved as AI or PSD, and as high res PDF for printing purposes. Put them in a folder on your thumbdrive called “yourlastname-alphabetdesign”. I will not open any files that are not in this folder. You should also turn in a printed, typed set of the design guidelines you followed to create your alphabet. Put this in the “yourlastname-alphabetdesign” folder as well, saved as a Microsoft word document. Finally, include a copy of the text you used as inspiration, saved as a Microsoft word document or a PDF, if it is not reproduced in its entirety on your poster design.